The predicted battle for the elapsed time victory in the Newport Bermuda Race between the three Mini-Maxis in the Gibbs Hill Lighthouse Division is coming to fruition. Based on the tracker report as of 5 AM on Saturday with 485 nautical miles to the finish, Bella Mente, Shockwave, and Caol Ila R are racing head to head, though at slower speeds (3 knots) than they were making before midnight. Some 20 miles astern are the 70 footers Kodiak, Rima 2, Irie 2, and Terrapin. By 12 PM Shockwave had taken the lead at 435nm from Bermuda. Caol Ila R and Bella Mente were close behind at 438nm and 442nm respectively. Shockwave’s vmg from the start is reported as 9.2Kts. The rest of the 163-boat fleet is in a large clump extending about 50 miles, where the wind may be a bit stronger. Wind under 10 knots are predicted for most of Saturday. Everybody is a few miles to the west of the rhumb line, indicating that they’re all headed toward the favorable predicted current in the Gulf Stream, some 100 – 150 miles ahead. The sea is reported to be flat. 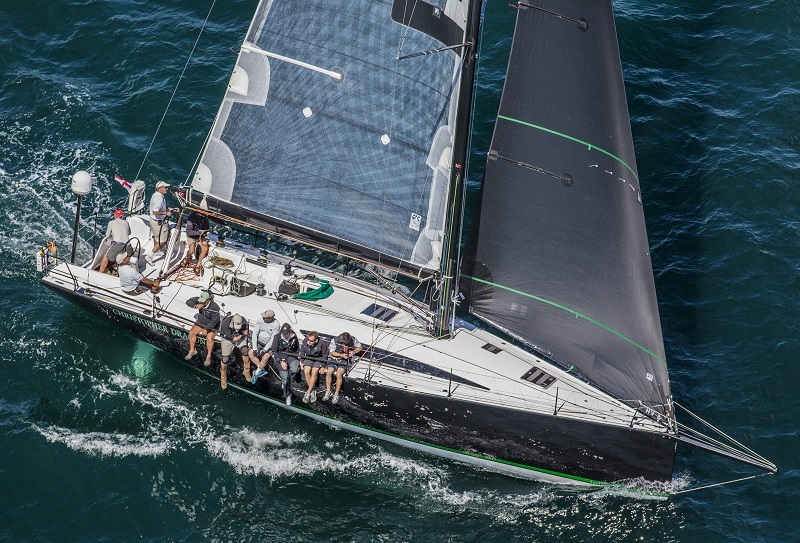 Right in the thick of things, the two yachts that have won all the St. David’s Lighthouse trophies since 2006, Rives Potts’ Carina and Peter Rebovich’s Sinn Fein, were well up in the pack. At the 10 AM report — tracking positions are still delayed for 4 hours — Sinn Fein in Class 1 was actually three miles ahead of the Class 3 Carina, 490nm from the lighthouse finish line. Christopher Dragon, owned by Andrew Weiss, was the St David’s Lighthouse Division estimated elapsed time leader and was 477nm from the finish. Sinn Fein stood second. Toothface2, in the Double-Handed Division, returned to Newport Friday night. Michael Dreese, her captain, reported a broken pump in her water ballast system. Next Boat, in the Double-Handed Division, owned by Mark Ellman, withdrew on Saturday morning due to concerns about possible damage and is returning to New York Harbor. The best way to follow the race is to log onto the Pantaenius Race Tracker. Dobbs Davis has a very useful Race Tracker Tutorial. Dobbs, an experienced racing sailor and columnist for Seahorse Magazine, is posting a twice-daily race report on the website, beginning with his Friday Bermuda Race Preview. Class assignments, handicaps, crew lists, and other important information is available on this website at Race Documents & Rules. One of the most important players in any Bermuda Race is the Gulf Stream. Currents and winds are displayed on the tracker. For a report on this year’s Stream, see Dr. Frank Bohlen’s Gulf Stream Tutorials. For information about the race, its history, its prizes, and its appeals, take a look at Bermuda Race Facts and other sections in the About tab on the website. The first Russian entry in the race’s history started off Castle Hill. The J-120 Sunset Child, in Class 4 (St. David’s Lighthouse Division) is chartered by a group including skipper Dmitry Kondratyevis, Dmitry Konrat, Rodion Poloskin and other experienced sailors. They raced Sunset Child in the RORC Caribbean 600, finishing in the middle of the nearly 50-boat fleet. In sheer numbers and variety, the crowd of spectators watching the June 20 Newport Bermuda Race start has to be the most impressive in years. An estimated 1,000 people watched from the shore, many of them at the Castle Hill Inn, but many others along the rocks near the Castle Hill Lighthouse nearby lighthouse. On the water there must have been at least 75 boats—RIBs, catboats, Sonars, cruising sailboats of all sizes, and many, many powerboats that included several classics. The glare from the varnish was blinding on this beautiful bright day. One of the most historic boats was Corsair, a launch from one of J.P. Morgan’s former steam yachts of another era. Like an able skipper of a racing boat on a starting line, her captain was able to squeeze her into almost any spot, except that he could do it both in reverse and forward. This great fleet was patrolled by the Race Committee and by the U.S. Coast Guard both thoroughly and professionally. A small collision before the race, apparently with minor damage, reminded everybody of the risks and dangers of pushing too close. Even then, all these boats on both sides of the starting box squeezed for every inch they could get. Sometimes the hard-working Coasties and the other race patrol officials had to blow a whistle, flash a light, or make a loud shout. As the day went on and the last of the 14 classes started, the spectator fleet gradually shrank, yet at the end there were at least 30 boats out there as the racing fleet sailed toward the horizon. For scratch sheets, crew lists, and other information about the boats, go to Race Documents & Rules. Twenty-nine of the two Newport Bermuda Lighthouse Divisions’ entries are also sailing the 25th Onion Patch Series, a tough triathlon of offshore racing. These Onion Patch racers have just sailed the NYYC 160th Annual Regatta presented by Rolex in Newport and will form the core of the June 27nd RBYC Anniversary Regatta which now has 32 entries. The RBYC Anniversary Regatta is open to all IRC or ORR rated yachts over 25 feet in Bermuda. Anniversary Regatta entries close at noon on June 25th. Information is online at www.onionpatchseries.com and at www.rbyc.bm. www.BermudaRace.com carries Newport Bermuda Race rules, news, videos, photos, history, and expert advice. Race news is also posted on the Newport Bermuda Race 2014 Facebook page and on Twitter at @BdaRace.